between Grand Route Saint John and Ponce de Leon. Henry Vignaud was a journalist, diplomat, and historian. He was born and educated in New Orleans. His career as a journalist commenced with articles for the newspapers of New Orleans. With the outbreak of the Civil War, he became a captain in the 6th Louisiana Regiment but was imprisoned in 1862, when New Orleans was captured by the Union Army. He escaped, went to Paris, and never returned to the United States. In Paris, Vignaud entered the service of the Confederate mission under John Slidell. In 1869, he was appointed to a secretaryship in the Roumanian legation at Paris. On December 14, 1875, he was appointed second secretary of the United States legation in Paris, and on April 11, 1885, was promoted to be first secretary. For thirty-four years, he was an indensable member of the Paris mission, frequently acting as chargé d’affaires, and serving always with distinction. Vignaud’s distinction was achieved after the age of seventy. His special interest in Columbus grew out of his close association with Henry Harrisse and with the Peruvian scholar Manuel Gonzalez de la Rosa, and the publications of the Columbian anniversary in 1892. He published several works on Columbus and European exploration during the 15th and 16th centuries, including: La Lettre et la Carte de Toscanelli (1901), Toscanelli and Columbus (1902), Études critiques sur la vie de Colomb avant ses découvertes (1905), Histoire critique de la grande entreprise de Christophe Colomb (2 vols., 1911), Améric Vespuce, 1451-1512 (1917), and Christophe Colomb et la Légende (1921). Vignaud also displayed a broad interest in the whole range of studies of aboriginal America and of the earliest European contacts with the new world. His work was recognized by the award of numerous honors and prizes, and by election as a foreign corresponding member of the Institut de France. Vignaud’s library of many thousand books, pamphlets, and maps now resides at the University of Michigan. Vignaud’s work also includes an unfinished history of cartography in approximately 650,000 words. 1863 vignaud1863jan29 Written in french. I am not fluent in french but I believe the article says Mr. Vignaud occcupies a place of distinction in Louisiana literary circles. Anyone care to translate? 1876 vignaud1876feb20 Vignaud mentioned at the end of “Glimpses of Life in Paris” article. 1900 Click here to view “A French Tribute to the Distiguished Orleanian” article in the February 25, 1900 issue of the Times Picayune. 1903 Click here to view “Henry Vignaud Argues Against Authenticity of Work” article in the January 12, 1903 issue of the Baltimore American. 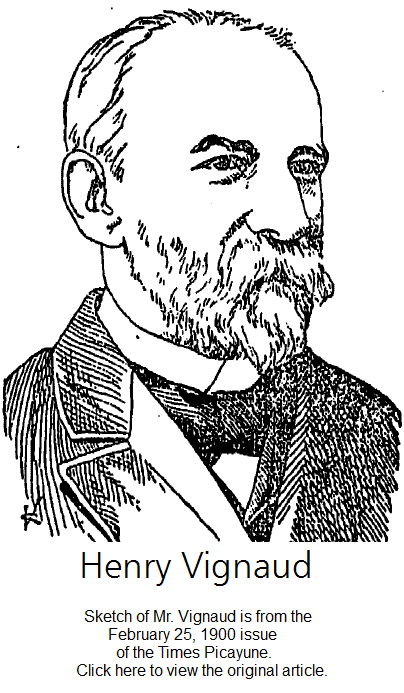 1908 Click here to view “Henry Vignaud to Receive Highest Literary Honor France Can Bestow” article in the January 12,1908 issue of the South Carolina State. 1909 Click here to view Henry Vignaud Resigns at 79 article in the February 16, 1909 issue of the Grand Forks Herald. 1909 Click here to view “Henry Vignaud’s Opposition to Canonization of Columbus Wins Him Title” article in the November 21, 1909 issue of the Fort Worth Star Telegram. 1911 Click here to view “Henry Vignaud, After Fifty Years of Research, Issues Historical Work in Which Famous Explorer is Branded as Imposter and Humbug” article in the March 21, 1911 issue of the Ohio Plain Dealer. 1912 Click here to view “Prince of Americanists” article in the October 27, 1912 issue of the Times Picayune.